As we inch closer to the official start of summer, I’m anticipating long days by the pool and (hopefully!) zero sunburns thanks to meticulous sunscreen application. However, let’s just be real and assume that at some point this summer, we’re all going to get a bit too much sun and need some relief. Before you reach for a bottle of bright green “aloe” gel loaded with a billion other ingredients besides soothing aloe, consider a few great DIY sunburn relief options. Throughout the week, I’ll be sharing a few excerpts from a great beauty DIY book that I’m obsessed with, 100 Organic Skincare Recipes, so you can have these recipes at the ready for when you need a little sunburn relief. I purposefully chose these DIYs because they seemed within reach for even the clumsiest DIYer (aka people like me). The ingredients and tools needed for these recipes aren’t outrageous, and you probably already have a lot of it on-hand anyway. It’s up to you to get mixing! Enjoy. Have fun slathering yourself from head to toe with this silky, cooling, moisturizing yogurt mask. The natural emollients and lactic acid in yogurt provide a safe and gentle, nonabrasive moisturizing exfoliation. Be sure to use full-fat yogurt, as your sun-kissed skin needs the extra moisture. Run a cool-warm bath, not hot. The cooler, the better, but it should be warm enough to sit in for at least 10 minutes. Place the yogurt and baking soda in a bowl and mix well with a fork. Stir in the essential oil. Apply the cool yogurt mixture to your skin from head to toe. 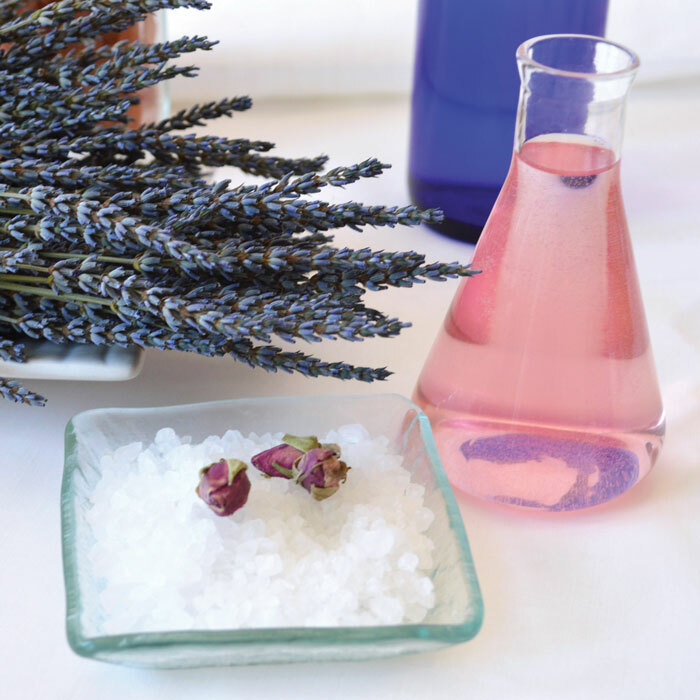 Place the lavender buds inside of the cheesecloth to form a loose sachet, leaving room for the water to flow through and the buds to plump in the bath water. Tie closed with a string and put it into the tub. When the tub is full, get in and let the relaxation begin. The yogurt mask will dissolve off of your body and mingle with the lavender, creating a milky, moisturizing, relaxing elixir for mind, body, and spirit. Use the lavender sachet as a soothing wash bag by filling with water and squeezing out over your sore, sunburned skin. Use it as a spot treatment and compress. Place the cucumber slices over your eyes or directly on sunburned areas as a cooling anti-inflammatory treatment. Leave the yogurt on your face for up to 15 minutes. Drain the tub and rinse off with a quick shower. Gently towel dry and generously moisturize while your skin is still damp.